posted: January 23, 2018 by: dmd Tags: "Clinic Specials" "News"
February is National Pet Dental Health Month. Hillside Veterinary Clinic would like to make our clients aware of the impact dental disease has on their pets' health. Dental tartar and gum disease are rarely causes of immediate disease in dogs and cats. It is a smoldering process which slowly erodes the gums and underlying bone. Tartar and plaque harbor dense populations of bacteria which feed into the bloodstream at a constant rate. The bacteria are filtered in the liver and kidneys causing microscopic areas of abscess and tissue loss. The immediate effects are not apparent however long term effects are cumulative. Over many years the animals may develop chronic kidney failure or chronic liver failure. These are the most severe outcomes of untreated dental disease. More commonly your pets will experience bad breath, sore gums, loose teeth, missing teeth, throat infections, or increased nasal discharge. 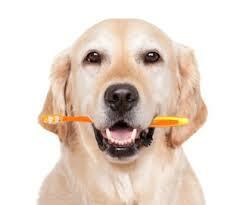 Dogs and cats require periodic dental cleaning and polishing, along with regular brushing of their teeth. Hill's Prescription diet T/D and Hill's Science Diet Oral clean teeth more effectively due to their unique composition. They have been shown to significantly reduce bad breath and tartar build-up. We encourage regular dental cleaning for all dogs and cats. Dental cleaning does require a general anesthesia. Preoperative blood testing helps us determine the safest anesthetic protocols for your pets. I.V. fluids are also used during anesthesia. The benefits of dental cleanings are many and very important to your pets' health. For more information check out the Care Guide on this website, http://hillsidevetclinic.net/care_guide.html?p=17&type=Canine, as well as the American Veterinary Medical Association at https://www.avma.org/Events/pethealth/Pages/February-is-National-Pet-Dental-Health-Month.aspx.